Times Observer photo by Brian Ferry Warren Area High School biology student Taylor Lester, with the help of Warren County Career Center health and medical assisting student Tyler Noe, listens to the vital sounds of SimMan in the program’s multidisciplinary simulation center. 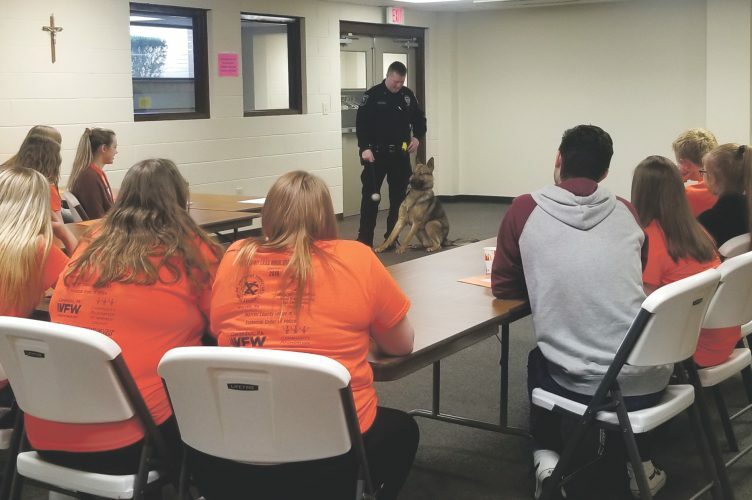 Students at Warren County Career Center were teachers for two periods on Friday as some of their peers from Warren Area High School paid a visit. 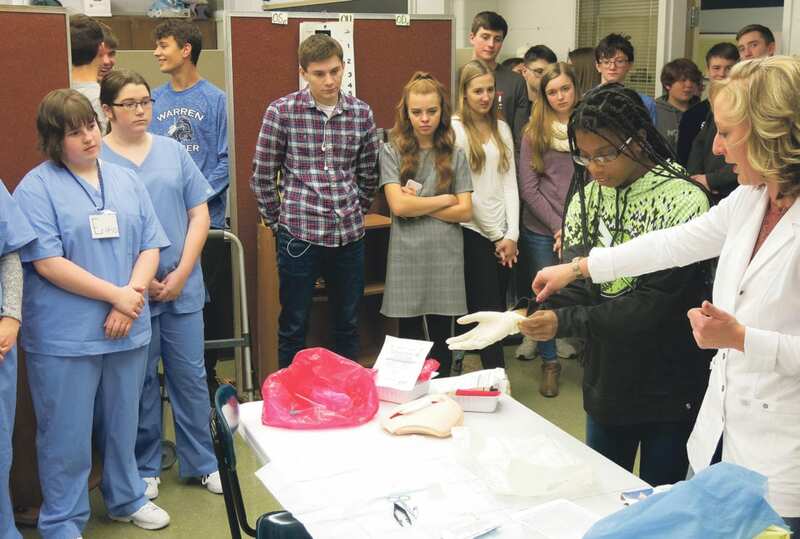 Students in honors biology classes walked to the career center to observe and learn from students in the Health and Medical Assisting (HMA) program. The program received a grant that has allowed for the development and purchase of a multidisciplinary simulation center. That’s been a great asset to students in the program. It’s also available as an asset to students who are not in the program. “While the HMA students have benefited tremendously from the purchase, I have had numerous discussions with science and math teachers throughout the Warren County School District regarding how the simulation center could be used to reinforce the practical application of what their students are learning in the sit-down classroom setting,” HMA teacher Kylie Harris said. Times Observer photo by Brian Ferry MacKenzie Tucher with Taylor Kraft of the Career Center health and medical assisting program shines a black light on WAHS biology student Ian Darling’s hands after he used GloGerm on them. With GloGerm, germy areas glow under the light. She said the visit also gave her students a look at some possible career paths. The biology and HMA students practiced giving injections with injectipads and a manikin. “Students taught hand-washing and the transmission of microscopic pathogens through the unique ‘GloGerm’ setup,” Harris said. 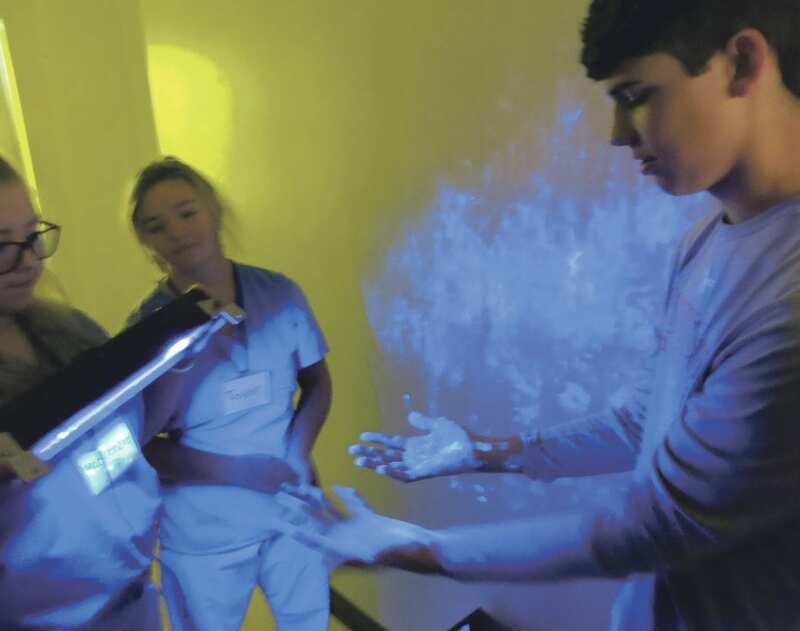 Using a black light, students could see germy areas on their hands before and after hand washing and the transmission from their hands to a wall. Harris, herself, led a demonstration on how to avoid contamination during a medical procedure. Times Observer photo by Brian Ferry Warren County Career Center health and medical assisting teacher Kylie Harris instructs Warren Area High School biology student Serena Clarke in avoiding contamination in a medical treatment environment. “Finally, an incredibly high-level simulation scenario involving a patient with advanced sepsis due to an influenza infection,” she said. “Students who taught within the advanced simulation station discussed subjective data the patient would likely state, likely laboratory and other diagnostic findings, assessment pieces, and synthesis of all data into the end-resulting diagnosis of sepsis. 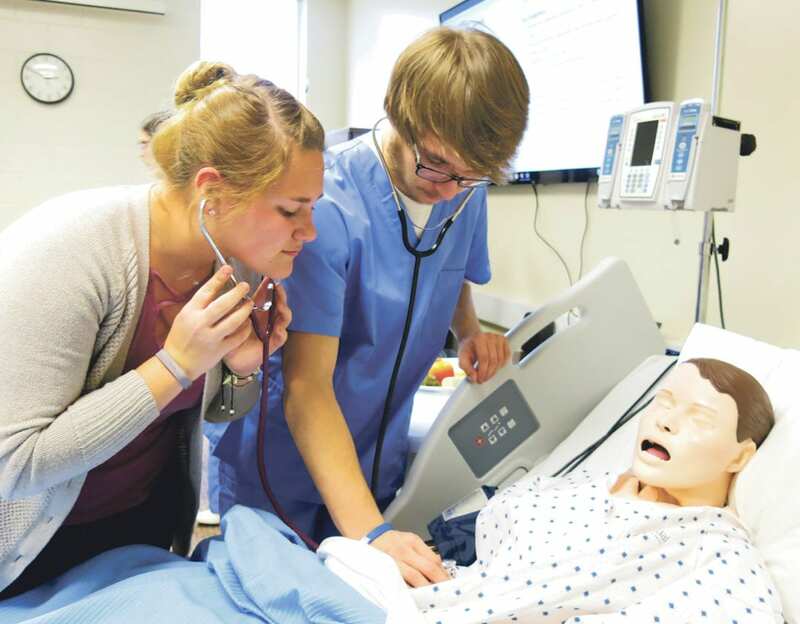 “Students were given an opportunity to physically assess the SimMan and formulate an individual diagnosis based upon all components,” Harris said. The experience was an excellent demonstration of her students’ progress. “Students learn in a variety of ways, a major method of which includes teaching,” Harris said.